Religion and science both claim to own the secrets that unlock the origins of the universe. But try as it might, science cannot escape God’s design of the universe. In fact, scientists continue to prove the existence of God inadvertently. For example, scientists tell us that at the beginning of time the entire universe was a tiny fraction of the size of the period that ends this sentence. Then one day for no apparent reason this little dot exploded into our universe. Time, space, light, planets, and stars suddenly appeared. Scientists have no explanation for this – it just happened. But Christians know what happened, the Bible tells them about the creation of the universe and man himself. The Bible contains answers to many scientific questions. But sometimes individual interpretations of the Bible get in the way of God’s message. 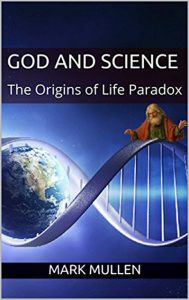 Find out how in this book as both science and the Bible are examined as we search for a higher understanding of the meaning of life. Far too many talking heads, (politicians, the media, scientist) accept and promote Darwin’s theories of evolution as an absolute truth. I cannot accept that our relatives are descendants of two non-living cells that came together and formed life. Forget about being a descendant of the apes. According to Darwin, all life stems from an unknown, unplanned biochemical, molecular reaction. I cannot accept the life is an accident theory. I set out to write this book to show readers that science is a tool God provides man to help us understand the importance of God’s role in our world. It’s not the tool we need to question. It’s the choice of tools and how man uses them.